255 million years ago, there were a family of dinosaurs known as Moschops (meaning calf face) which stalked the plains of South Africa in search of vegetation. They did not, I repeat did not, wear baseball caps. 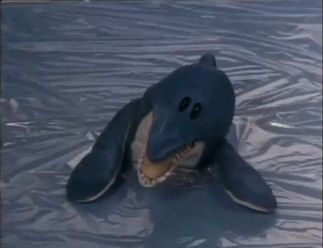 Fast forward to 1983 and FilmFair decide to recreate the every day life of one of these calf faced herbivores. Complete with a baseball cap. The series focussed upon the gentle exploits of a young dinosaur called Moschops (baseball cap advocate) and his friends in a prehistoric valley. Moschops passes by the days by playing football - rather painfully with rocks - with his friend Ally (an Allosaurus) and looking after Flower - the first ever flower! On hand to provide support is the slightly manic Mr Icthyosaurus who likes to try his hand at spell casting and the chronic amnesiac Grandpa Diploducus. Ally's Uncle Rex also makes appearences with the avowed intent of instructing Ally in the ways of fierceness - something Ally is keen to avoid. The final character is Mrs Kerry - a rather busybody Triceratops who has an unhealthy obsession with tidiness. The show was produced by the legendary FilmFair who already had The Wombles, Paddington Bear and The Herbs under their belt. 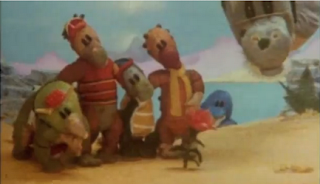 Moschops utilised the same stop motion animation techniques to bring its characters to life. The episodes were narrated by the characterful intonations of Bernard Cribbins - who had taken on the same duties with The Wombles. Thirteen eleven minute episodes were made and first shown on ITV in 1983 in the lunchtime slot. No further episodes were made, but repeats continued to air for several years afterwards on ITV and Channel 4. There have been a number of commercial releases of Moschops over the years. There was at least one VHS in the UK which was released by Castle Vision. Curiously, there was also a VHS release in the USA entitled Adventures in Dinosaurland - whether the show was ever broadcast there is another question. The 00s have seen a couple of DVD releases, but infuriatingly, these only comprise the first ten episodes between them. The three remaining episodes are, however, currently available on Netflix to view. 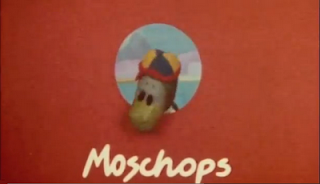 Curious British Telly was a big fan of Moschops back in the days of yore, so enjoyed revisting this beastie. FilmFair had a great ability to breathe life into their models with stop motion animation and Moschops benefits. This type of animation seems slightly quaint when compared to CGI, but it brings a level of slightly choppy charm that CGI can never reproduce. This coupled with the detailed design of the models means it's an attractive looking show. Helping the show get off on a good foot is the wonderfully inquisitive rock 'n' roll theme tune composed by Daryl Runswick. Moving onto the stories themselves, CBT particularly liked the way the writers (Ruth Boswell and Gregory Steward) tapped into the preschool audiences fascination with a rapidly changing world by installing Flower as a nice touchpost. One criticism we have is that the stories are a little too gently paced and slight, but again, this was aimed at preschoolers, so don't expect any Dostoyevsky epics. For the sake of nostalgia, CBT recommends revisiting the show if you remember it from your youth, but otherwise it's best to check out the other FilmFair gems first. I had a lot of fun doing the music for Moschops. Ruth Boswell, the producer, had no money to spend really and asked me to be as frugal as possible. I knew I could get free studio time at the Essex Music studios in Poland Street, London, if I gave the publishing rights of the music to Essex Music. That saved a bit of money. We couldn’t afford session musicians so I brought in friends who were either not professionals or not Brits: the talented young bassoonist Sarah Watts, then still a teenager, my girlfriend Judith Ackrill, a good amateur musician who played tinkles on the percussion, and the wonderful Australian clarinettist Peter Jenkin who was visiting the UK at the time (and teaching me the clarinet). I played bass guitar, electric piano, descant recorder, additional percussion and an instrument of my own invention, the piccolo bass guitar (a bass guitar tuned with fine gauge strings an octave higher than normal). This line-up gave me great variety: the bassoon could play bass-lines but also melodies and rhythm fills. The clarinet could join in with the fills and do tunes too. The percussion and the recorder supplied the high sounds. I recorded the music for the entire series in one three-hour session by the simple trick of composing music that could be used over and over again in different episodes. 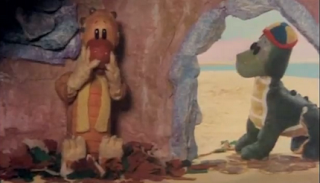 I tried to put the style of the music – kind of stone-age rock’n’roll – in the great tradition of children’s TV from The Magic Roundabout to Postman Pat. We had a ball with it.